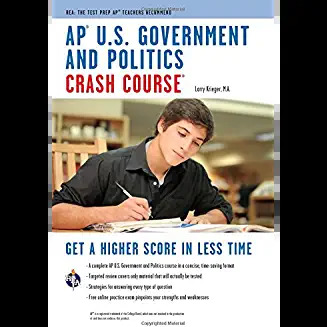 I recommended that my AP US Government students buy this book because I think it is the best with regards to the curriculum alignment. I especially think that the practice tests are more aligned with real AP multiple choice exams than 5 Steps. 1. Some of the information (even in the practice tests) is random and not likely to appear on the AP exam. 2. The free response questions are not configured or scored the way real AP free response questions are done. They aren't written in the format that is always used. A student is much better off completely disregarding the free response questions in the book and using the actual, released FRQS (plus rubrics) found on the Collegeboard website. I am so thankful for this book. I basically used government class as a study hall the entire year, so without this book I would have failed. Luckily, our classroom tests happened to be very closely aligned with the AP exam, so before every unit test I would read the corresponding chapter in this book while highlighting key information, and then read the chapter again. That's it. Compared to the (busy) work assigned in most classes, this book is great; it weeds out the important stuff, gives you a handy glossary (know all those terms and you'll get half the questions on the AP test right), gives you TWO practice tests (I only had time to complete one, but I recommend at least doing both sets of FRQ's), and basically saves you a load of time and worry. What I love most about this book is that the information is concise, but it doesn't skimp on words when explaining concepts; everything I had trouble wrapping my brain around suddenly "clicked" when I read this book. I will say that rushing through this book the week before the test doesn't guarantee you a five; what you put into it is what you get out of it. For me, it was especially useful to highlight and sometimes take notes in the (huge) margins, since I tend to skim passages without absorbing anything. Needless to say, without this book I wouldn't have gotten a five. It help to get an idea on what's going on the ap exam by giving me like 5 practices test. 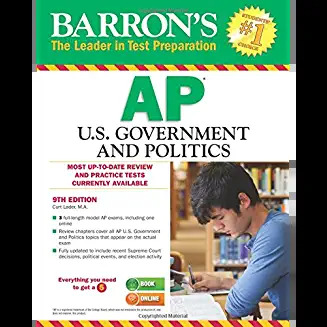 I used it along with Barron's prep book and they both help me a lot, it's like those both book are meant for each other, if a topic is not well explained in one the other explain it we and vice versa. This Prep book is for the ones who like to review in a detailed manner. The only insignificant problem that I found on this book is that it doesn't have an index section, however it does not matter if you already read the book, but it will be a great gadget when you want to find something specific. My 10th grader is currently study for the AP test to be held in two weeks. There are certain areas that he needs to focus on and this book allows him to target his studying. Each section has a summary of the topic and then review questions with explanations of the answers at the end of the chapter. He was immediately engaged by the book. The mock exams at the back of the book as well as the online tools make this a very valuable study too. Well done. Well organized and thoughtfully written. Clearly written and organized. My 14 year old found it a great addition to her test prep materials and study groups. Most of the other kids in her AP class had the Barron's book. The subject matter can be daunting, but Barron's helped the test prep feel manageable, not overwhelming. A must have if you are taking the class and want to score well on the exam. Purchased for our daughter taking this class in H.S. Was very helpful in her preparation for the AP exam, which she did pass and transfer to a major university. I found this very helpful while trying to study for the AP Gov test. I did not take this course, so I relied mostly on this book. Also, my attempt at this was to learn (enough of) this course in a two weeks span. It was very useful as it provided bullets points, sections with main ideas, and other important information. 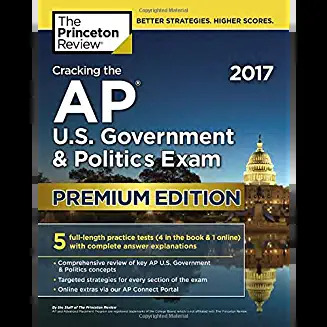 The thing I liked the most about it was that the book gave me a rundown of how the AP Gov test works, and what I would need to do to get a certain score. The book it specifically based around teaching the most important information. They decide this by looking at previous years of tests and breaking down what questions were being asked and how often. It was good to know that I'm not just reading over information that probably wont be needed to be known for the test. I ordered several of these for my AP GoPo students. I ordered several of these for my AP GoPo students, and they all gave me positive reviews. The book is organized in a very logical manner, complete with vocab sections, tables, and examples of concepts. This book stresses the most commonly tested concepts on the AP exam (including linkage institutions!) and gives strategies for answering questions. I teach AP GoPo in the Fall, so my students have a full 5 months between the time class ends and the exam, which means focused review is a must. Students felt that this book really helped them with their last two weeks of studying. I will order class sets for next year. For classes like Ap.Us Goverment, it is mostly memorization, unlike AP U.S history or AP Euro, where you have to explain alot of things. Having a compilation of things to memorize was so helpful. I ended up just using this book for both my class and test prep and it was phenomenal. It is succint -- it goes straight to the point and picks the terms you should already know. All the cases are monumental. I also bought the princeton Review but found book to be confusing and finding vocabulary at the back of the book in glossary seemed like an unnecsary step, when they could have provided it right next to the term. I read the whole book in 2 days before the test, and felt that it covered most questions from the test. beside 4-5 questions. Highly recommend, if you are already taking the course with it.